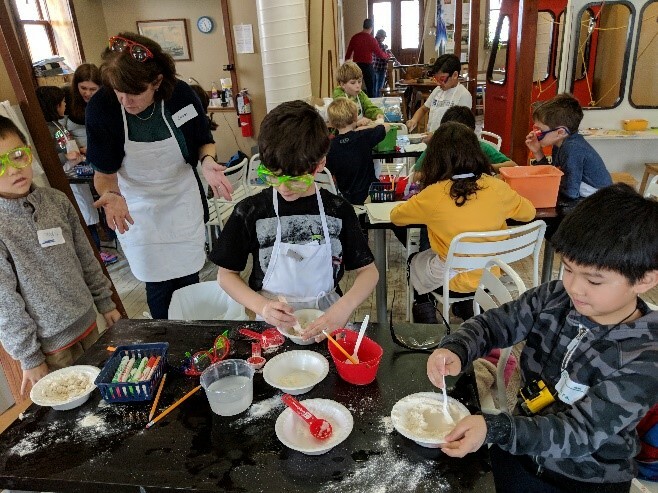 Celebrate Engineering Week 2019 at the Explorium! By popular demand, we are offering FIVE days of unique STEAM experiences! You can register for 1 or 2 or ALL 5 days. We are offering our well loved workshops like Rollercoasters, Light It Up, Car Design and many more. There’s something for everyone of ALL ages and Every day is a unique experience! All our programs are run by highly qualified educators and certified teachers. We bring engineering concepts, aligned with common core standards, to ALL ages in a fun way to inspire interest in STEM. Monday = Come join us as we “geek” out and have fun exploring virtual reality, Oxobots, Little Bits, Lego Vernie and more! Bring your own device (BYOD) and take part in an “Hour (or more) of Code”. Tuesday = Chemistry is OUT of This WORLD! Our friends from Stony Brook University Graduate Education Outreach club will challenge and excite you with unique chemistry activities. Nature of Dye: Grind up bug parts to make a color for your painting? No way! Yes way! Chemists do it all the time. Make your own art from your own dye. Chemistry is Colorful: Chemists use paper chromatography to solve mysteries. Help us figure out what is going on in the problem we need you to solve. Chemistry Makes Scents: Gently squeeze each mystery scent bottle and let your very own nose be a chemist! What can we learn about scents that smell alike and different? Wednesday = Light it UP! Learn about simple circuits and add your creativity to design a lighthouse. Thursday = Rollercoasters! Transform the Explorium into an arena for wild rides! Friday = It’s Tech Friday! Want to learn what computer science is all about and how the future is going to look like? Spend time with our Microsoft expert in cybersecurity and explore the future! Cost: $50/day/child. Light peanut free snack will be provided. Time: 9 - 12 pm. Drop off beginning at 8:30 am. Discount: 20% off if you register for 2 or more days OR register 2 or more siblings (use code: multiday)! Deadline for registration: Feb 13th.